The product everyone has been buzzing about, the VeganEgg from Follow Your Heart (makers of some of my favorite salad dressings and the most amazing vegan Provolone cheese!) is now available on Amazon! This has probably been the most-anticipated vegan product launch this year, and for good reason! Sure, vegans have had egg replacers for years now (I love Neat Egg, Ener-G Egg Replacer, Bob's Red Mill Egg Replacer, and The Vegg Vegan Egg Yolk + Baking Mix Set), but those were used mostly in baking, and you couldn't really make a scramble and certainly not an omelet with them. Don't get me wrong, tofu scrambles are awesome (and I make them a lot), but they don't have that fluffy consistency of eggs. So that's why I (and many others) have been dying to try this stuff for a long time! I hadn't ordered it yet since shipping costs from other stores were a bit high, and since Follow Your Heart said it was coming to Amazon.com any day now. It finally arrived on Amazon and I've already ordered mine! It's around $7.50 for a 4 ounce carton of the VeganEgg on Amazon, and comes with free 2-day shipping for Prime Members! I can't wait to make scrambles, omelets, quiches and more with this cruelty-free and compassionate alternative to eggs. FYI - the egg industry is one of the cruelest in the animal agriculture world, grinding up live male chicks that can't be used for egg production, cramming egg-laying hens in tiny battery cages and manipulating their egg-laying cycle by basically torturing them in order to get them to lay the most amount of eggs, and the conditions are absolutely toxic and wretched for both the poor chickens and the human workers - you can learn about more reasons to ditch eggs on eggindustry.com, which is run by Compassion Over Killing, a very good resource to educate yourself on the horrors of the agricultural industry. Also, "21 Things the Egg Industry Doesn’t Want You to See" is a quick break-down of the brutality living beings, both human and animal, endure at the hands of the egg industry. And, frankly, eggs aren't even that good for you despite the lies/media campaigns the American Egg Board tries to fleece the American public with. The AEB is scrambling (hardy har) now more than ever as egg sales decline, plus they are in hot water after it surfaced that they tried to obstruct Hampton Creek's (makers of the yummy and eggless Just Mayo) products from being sold in Whole Foods. The egg industry is shameless and evil, built on exploiting living beings and engaging in unethical practices. Thankfully, people are becoming more aware of the awful truths of the egg industry, and giving up eggs in amazing numbers! And now that there is a solid, plant-based, and cruelty-free alternative on the market, there is no good reason to continue supporting such a horrible industry. Replace eggs with the new VeganEgg, available now on Amazon! 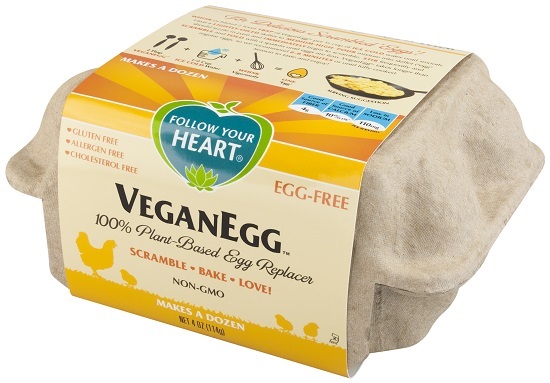 The VeganEgg is also available from other retailers, just check out the list on the Follow Your Heart site here! I can't wait to try this!!!... YAY! !